Squigly is the last "surviving" member of the Contiello family, a long lineage of opera singers and among the Medicis' most valuable clients. Fourteen years ago, Squigly's mother Selene obtained the Skull Heart under strange circumstances, and as a result, Lorenzo Medici ordered an attack on the Contiello family. Fraught with despair, Selene became the Skullgirl and revived her family as an undead army. What spared Squigly from becoming a mindless minion was the intervention of the Parasite Leviathan, the Contiello family's friend and guardian. 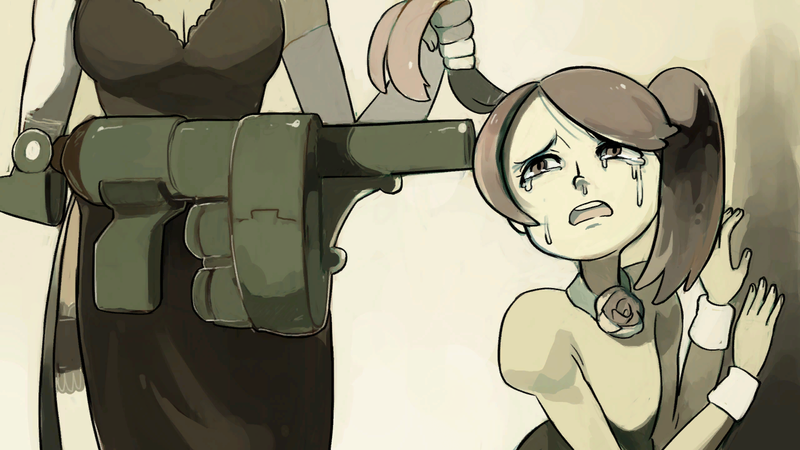 The battle between the Skullgirl and Lorenzo threatened to spread across New Meridian if not for Squigly and the intervention of the ASG, resulting Selene's defeat. The power that animated Squigly faded, and hers were the only intact remains of the Contiellos found. Lorenzo generously paid for their funeral and has not had conflicts with the Medicis' other clients since. Squigly is a character whose special moves are executed through stances. The stances gives her great pressure game alongside her grounded overhead, and can be used to power up her special moves. Her most unique tool is Sing (236MP) which freezes the camera in place and creates a corner anywhere on the screen. The charged version creates a superflash, allowing Squigly to pause the action and react accordingly, such as with her Daisy Pusher super, which is cannot be jumped out of after the Sing flash. Her grounded special moves are executed by first entering a stance, then releasing the button. The button used determines the special move. Holding a button for a certain amount of time will have Squigly gain a charge for that stance - either a punch or kick charge. This makes entering the associated stance much quicker and powers up the special moves. Charged version of sing (236MP) brings the opponent in and causes a super flash which forces hitstop on the opponent. With the help of an anti-air grab assist, this can setup the game's only unblockable setup. Seria Center Stage (with charge 236MP) - Brings the opponent to Squigly. With a charge, causes a super flash, and lets Squigly react to what the opponent is doing. Dash or Run: Squigly has a slow forward run and a slow, extendable back dash that will end after a set distance. c.HP - Cremation - Multi-hitting low assist that is very active. Center Stage - Setup assist. When Squigly sings as an assist, the point character can exploit her forced screen movement while taking other actions. Running forward while calling the assist instantly closes the distance against a fleeing opponent. Timing the assist during a combo allows a point character to use a wall bounce in a combo at the middle of the stage. Using Center Stage in concert with a command throw can grab an opponent at a seemingly unfair range. The first hit has shorter range and pulls the opponent towards Squigly while the second hit has the attack's full range. The vacuum effect of the first hit alone can be used for crossunder resets in the corner. It can also be used for midscreen crossunders from combos using certain assists. Pushes Squigly slightly forward, making it useful for some specific resets. Against aerial or knocked down opponents, this move can be jump canceled, making it occasionally useful as an alternative launcher. The first frame data graph shows tapping LP. The second frame data graph shows holding LP for the maximum possible time. The second frame data graph shows the move on hit/block. When tagged out, a tombstone stays on screen and follows the point character. When tagging in, Squigly emerges from under he tombstone in a coffin, breaking it open for her tag in attack. Squigly poses with her back towards the screen, holding the pose and charging the stance as Leviathan's head glows with flame. During the stance specific dash Squigly holds her arms out and does the signature "Jiang Shi" hop. Squigly and Leviathan throw an explosive one inch punch. The attack has invulnerability to hits, but is difficult to use as a reversal; the minimum start up animation for the stance is always vulnerable. The attack is too slow to combo without a charge, but the Seria version has a shortened the start up that allows Squigly to combo out of her heavier normals. The startup of the stance occurs before the startup of the move. The startup is omitted in the data, but can be seen in the graph. It is possible to combo into the uncharged version of this move using the stagger from silver cord or by using assists. The sliding knockdown gives Squigly enough time to get one of her stances charged. Squigly's signature singing special move, which forces the screen to center on her. The Seria version causes a mini-super flash, complete with a forced hit stop like a regular super flash. Canceling Center Stage to Daisy Pusher can use this effect to create an inescapable throw set up. Leviathan pulls on Squigly like a disobedient dog on a leash, biting and chomping as he inches forward. Charging for the Seria version brings the attack adds hits, damage, and advantage on hit from the last bite. The Seria version of this move can be linked after with a Light normal, allowing for some damaging combo routes. A dragon punch with an actual dragon! Although this attack doesn't use a ↓↘→+P command, it still puts Squigly into Dragon's Breath. The →↓↘+P alternate input shares the same charge and can be cancelled the same way. The basic version has 1 hit and knocks the opponent off the ground to recover in the air. The Seria version has 3 hits ends with a full knockdown. If Squigly already has the Seria charge, the HP version of Draugen Punch will execute with the minimum stance start up (8f) and add additional start up invulnerability to these frames. Squigly plants her feet firmly apart and starts spinning Leviathan's tail in a circle as she charges the stance. She uses the tail like a jump rope to skip forward or back during the stance specific dash. Leviathan attacks with several, rapid tail strikes. The Seria version of the move ends with a slower stab that causes the slide stun. Squigly tosses Leviathan's tail, which hooks the opponent and drags them in. The stagger gives Squigly a guaranteed Daisy Pusher or combo of her choice. The basic version reaches about half screen and the Seria version reaches nearly full screen. The charged version will also ignore assists and only grab enemy point characters. Like many other "Get over here!" style attacks, this is extremely unsafe on block and whiff. The stagger of this move is once per combo. However, one can still combo off of the Seria version of the move even if stagger has already been used due to the generous hitstun. Squigly drops down, allowing Leviathan to submerge his tail below the ground and attack from underneath the opponent. The multiple hits push the opponent back before the knockdown from the last hit, reaching half screen after 3 hits with no charge and ending at nearly full screen after 6 hits for the Seria version. Standard issue dive kick. It has a minimum height and additional start up for the move itself, making an instant dive kick comparable to a slower instant air dash attack. The LK version starts significantly faster than the other versions but does not cause enough hit stun to start a combo. The MP version is slower, can start a combo, and will always force an opponent to land standing when it hits air to air. The HK version is the slowest, actually hits high, and ends with a second hit that will launch the opponent for a knockdown once per combo. The second frame data graph for the HK version shows the move on hit. The frame data graph for the 2nd use of the HK version shows the move on hit. Creates a multi hit, floating note projectile. Commands with LK+MK, MK+HK, and LK+HK all place the fireball at different fixed positions. The fireball pins itself to the screen position, allowing Squigly to push it around relative to the stage as the camera moves. Hitstop will increase to 15 when used simultaneously with charged Center Stage. "Time to bury you... six feet over!" Squigly opens a grave at her feet, buries the opponent, sprouts a randomly chosen flower on the mound, and poses for a moment before a casket crashes down from the top of the screen with the opponent inside again. Hitstop increases to 14 when used simultaneously with charged Center Stage. "And now... The grand finale!" Leviathan projects a massive fireball at an up forward angle. After it leaves the screen, the fireball returns to chase the opponent around from behind. The fireball will not disappear until it makes contact with all 8 hits. Hitstop increases to 12 when used simultaneously with charged Center Stage. If Squigly is hit by a snap while the fireball is on screen, then the fireball will disappear. Due to a bug, Solo Squigly vs non-solo opponents will not have the fireball disappear after being snapped. Beowulf's snapback from his grab stance can sometimes eliminate this fireball but it is not consistent. Squigly hovers across the ground and seeks an opponent. Upon contact, a scripted sequence occurs where Leviathan torches the opponent, inflicting heavily damage. Hitstop increases to 10 when used simultaneously with charged Center Stage. Performing her taunt is one of the two requirements for Squigly to have access to her level 5. The other requirement is having either charge available. A basic ground chain combo ending in sweep. Unsafe on block. A basic combo that utilizes a special cancel. A basic combo ending in a super. A basic air chain combo that sets up a restand. After the restand, you can choose to go for a reset with f.HP or throw. Based on Princess of the Crystal from Mawaru-Penguindrum. Based on Yoshika Miyako from Touhou. Based on Nui Harime from Kill la Kill. This page was last modified on 19 April 2019, at 00:35. This page has been accessed 225,289 times.